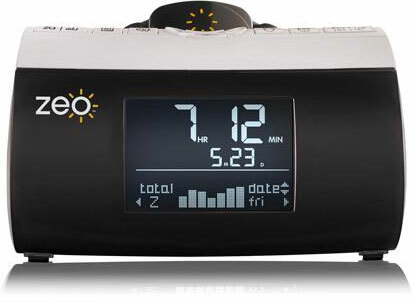 The Zeo Personal Sleep Coach attempts to bring the sleep lab to you. An EEG headband records the sleeping patterns, allowing you to learn more about your sleep habits. * Your Sleep Graph – summarizes your pattern of sleep phases each night. * Your ZQ - a single score we created to help you quickly gauge the quantity, quality, and depth of your sleep each night. * ZQ can range from 0 to 120 or more depending on factors like age, gender and stress level. * Total Z – how long you really sleep each night, counting any perceived and unperceived awakenings that we can detect. * Time to Z – the time it took you to fall asleep. * Time in Wake & Times Woken. * Total amount of REM, Light & Deep sleep. * Morning Feel – quickly record how you feel about your sleep when you wake up, so you can compare how you feel you slept to the objective data Zeo provides. I don't think that this device lets you see as far into your sleep as the DC Mini [picture] from Satoshi Kon's excellent 2007 film Paprika. But it's still pretty cool. A device that helps you have lucid dreams. Maybe not a problem for snoozing you, but be considerate of others. If you're like me, those carefully gathered numbers and graphs are useless. What you need is to have a humanoid robot perform an interpretive dance of your dreams.